Social Media – What is Best for My Business? I sat down for coffee last week with a man who started off the conversation with, “I’ve been told that my business HAD to be using Facebook, Twitter, LinkedIn, and YouTube!” He went on to mention “social media is the new thing” that his business needed to be using. Yes! I certainly agree that social media can be an important component to a business’ marketing mix. (Note: Social media is my business I would be crazy to say no.) With over 1 billion personal accounts on Facebook, 500 million Twitter accounts, 175 million LinkedIn professional profiles, and 4 billion hours of videos streamed through YouTube per month it is no doubt that social media marketing is an important piece to a business’ marketing strategy. Wait! Before you stop reading this blog to register for every social media account known to mankind, take a minute to think about your business’ marketing strategy. Yes, that document on your bookshelf that outlines your business’ marketing ventures, activities, logos, slogans, corporate colours, and target audience. Target audience: Otherwise known as your ideal client or your customer. Since you started your business five years ago, you’ve spent countless hours with your business consultant, marketing manager, and customer service representatives to develop a more focused idea of your client. Who are they? What sports do they play? Are they employed full-time or part-time? How old are they? Where do they spend their time? What social media do they use in their free time? Yes, just as it is important to have a clear idea of your client’s wants and needs, it is important to know where they spend their free time. Are they using Facebook to engage with friends? Or, are they on Twitter tweeting about Toronto’s most recent mayoral change? Figuring out where your client’s spend their time will determine the best social media platform for your business to use. Just like you wouldn’t purchase advertising in a financial magazine for your wedding floral services, you have to choose to spend your marketing dollars (and time) on marketing tools that make sense for your business. I hope this brief look into social media accounts and your target audience provides you with a clearer idea of which platforms to use in your business! Facebook has done it again. Facebook has rolled out how individuals receive notifications from the social media giant. They have now allowed users to determine how notifications arrive on their mobile device versus their computer or laptop, as well as what notifications you will actually receive. 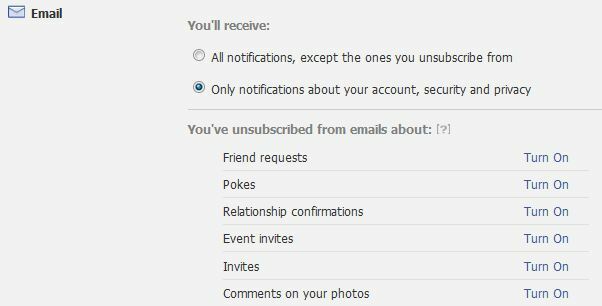 There are over 71 notifications that you could potentially receive from Facebook. You can keep track of when your neighbour or best friend sneezes. *Kidding* Users can turn off these notifications so that your email and phone remain uncluttered. Remember, this can be accessed through “Account Settings” and then “Notifications”. Is this technology, which claims to improve our lives, helping us, or is it just stressing us out even more? This is something I have thought about for quite some time. It comes up at dinner table conversations with my husband, and coffee shop conversations with my friends. Many times I have caught myself looking at my Twitter feed, without actually reading any of the tweets, or grabbing my phone even though there are no new notifications. Last night I tweeted an article called: How to Be Less Distracted By Technology. While the article has some great tips about turning off technology, like not opening too many internet tabs and filtering emails, it also suggests using alternate technology so as not to be distracted by existing technology… what? The new technology that is introduced in the article includes software like StayFocus, which is a “Google Chrome plug-in that lets you decide up front how much time to allow yourself to burn on those time-wasting sites before it cuts you off cold.” I think that’s a pretty awesome piece of software. How many times have you said, “I can’t believe I spent that much time on the My Little Brony site.” This way, a third-party source will cut you off when you have had enough. I agree that technological advances is a good thing for society, however it is becoming a challenge to work without the lure of emails, text messages, Twitter feeds, and Facebook messages. Implementing a few of these suggestions may help to alleviate some of the distractions!